Uncle Richard started this stall with his wife at Geylang Bahru Food Centre about 5 years ago when he was 49 years after he left the printing industry. They moved to Old Airport Road Food Centre temporarily when this food centre was undergoing renovation. 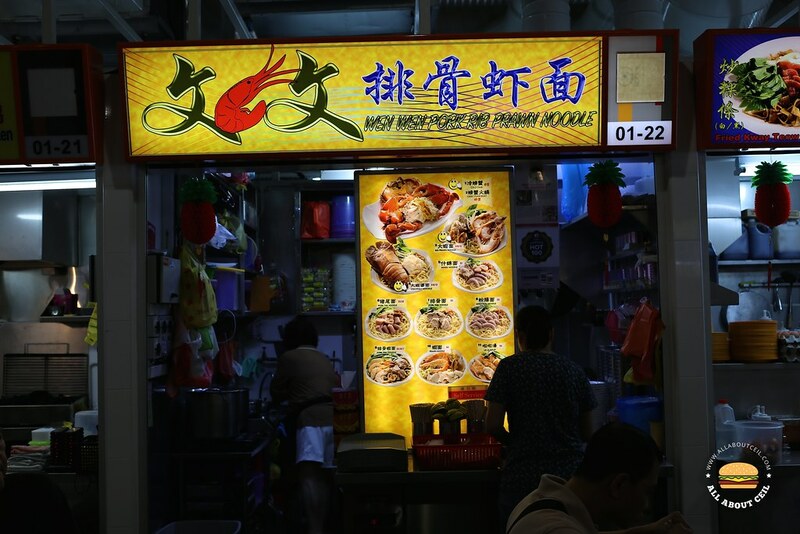 Their stall is famous for their prawn noodle but also the seafood hotpot, a popular choice amongst their customers, it is served with ingredients like pigtails, pork ribs, prawns, la la, crab and even canned abalone. Customers are also allowed to bring their own ingredients to add it in. There was no queue when I was there for lunch. I stood back a little, took a picture of the stall before proceeding to order. Uncle Richard seated at the table in front of the stall and he smiled at me when he saw me taking the pictures. I pointed at the picture of Big Prawn Noodle on their menu board and said, "This one". Auntie replied, "That will be $12. Is it okay for you?" It is indicated as $10 and $12 beside the picture of the Big Prawn Noodle on their menu board. This is probably charged accordingly to the size of their available prawns, these prawns were fresh and not frozen. 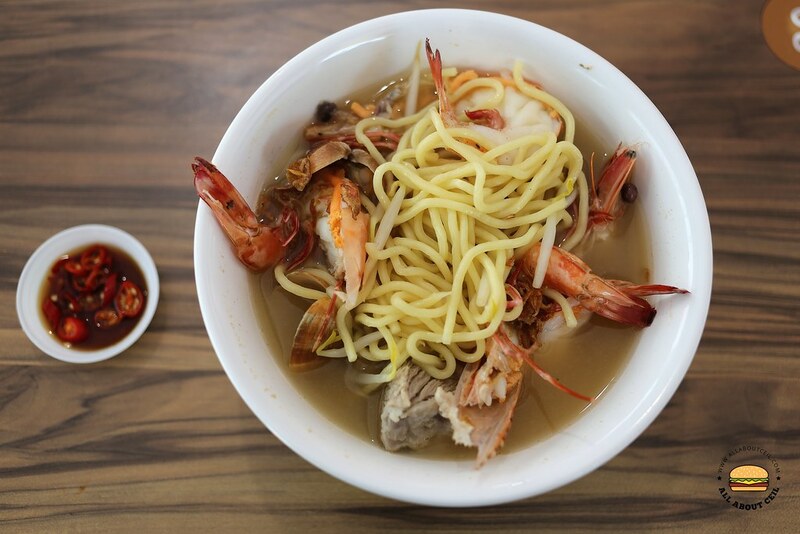 The regular Prawn noodle is priced at $4 with ingredients like average-sized prawns and sliced pork. Cold crab is a unique dish that is on their menu at a seasonal price. The friendly Uncle cooked those prawns and pork ribs in a pot over an induction stove. He then poured it into the bowl of yellow noodles. When Uncle handed it to me, he said, "If the prawns are not good enough, come back and tell me." He said, "I gave you 2 big pieces of pork ribs." I did not like the soup as much when I first tasted it but I began to like it more and more along the way. The soup though was lightly flavored but it had a pleasing notable natural sweetness. 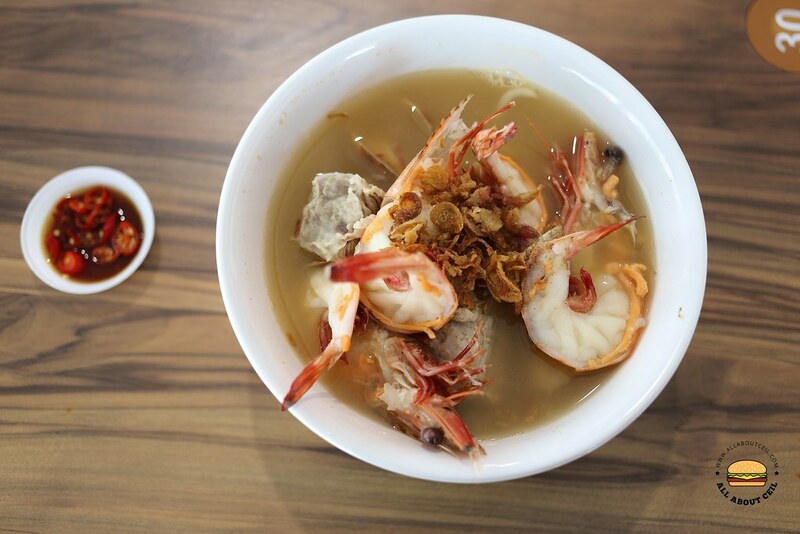 I could not help but compared it with the supposedly popular Sumo Big Prawn Noodle at Ang Mo Kio which I tried only once and did not like it as the sweetness of their soup was kind of artificially enhanced. Those big prawns were relatively fresh and the pork ribs were cooked to desired tenderness and there were also a few pieces of la la with a good portion of nicely cooked yellow noodles. It was an enjoyable bowl of prawn noodle.